This retold story based on the old Yiddish folksong, “I Had a Little Overcoat”, has been put into picture books numerous times in recent years. However, this compelling re-telling based on the notion of not wasting anything has added new dimensions. After the material is too small for even a tie, the Grandfather tailor makes it into a toy mouse. Even after that is worn out, it finds a charming new use. The author and artist notes at the end provide the connection between the folk tale and reality as each of them have family ancestors who were both emigrants and thrifty, resourceful people. The artist note will also be of help for teachers as Barbara tells readers how she chose where to set the book. She shares information regarding the wedding scene in the book. It was based on the synagogue in Hebron, Connecticut. Art teachers and parents can use this as an example that art comes from real life in many instances. The short, clear text is rhythmic and will delight silent readers as well as those listening. Children will enjoy guessing what grandfather will make out of the coat each time it wears thin. Teachers and librarians in the public schools will be able to meet core curriculum standards in reading, literacy, art, geography and history with this beautifully illustrated book. The water colors are soft and inviting. They make the reader comfortable enough to stay awhile to study each detail and still want to return again later to visit grandfather. 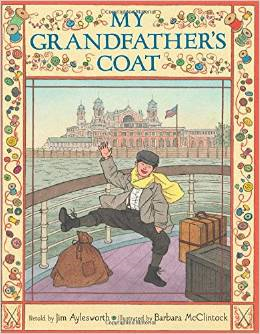 Everything about the story and the art work speak, not only, about how much grandfather loved the coat; but about how much the little girl loved grandfather. Extras: Author’s Note, Illustrator’s Note. Both tell of their own connection with family immigrations. Also explained are the models for some of the illustrations, such as the synagogue in Hebron, Connecticut.